No doubt you’ve already learned of the epic power provided by the all-new 2016 Ford Super Duty truck, which comes equipped with a number of different drivetrain possibilities, offering you huge amounts of horsepower and high rates of fuel efficiency. At the same time, you likely are acquainted with the selection of smart technologies embedded in the 2016 Ford Super Duty. But did you know that the Super Duty trucks are also outfitted with a spectrum of solid safety devices to keep you and your passengers as secure as possible on the road? From a Rear View Camera and powerful airbags to Trailer Sway Control, an SOS Post-Crash Alert System, and a Belt-Minder, the Super Duty is designed to keep you protected. With its Rear View Camera, the Ford Super Duty promises to simplify the process of parallel parking by giving you a comprehensive image of the rear behind your truck and ensuring that you can determine how close to parked cars you are. The Ford’s powerful system of airbags is meant to prevent serious injury during a collision, and comes with front seat airbags with a passenger side deactivation switch as well as a Safety Canopy system with roll-fold side-curtain airbags. 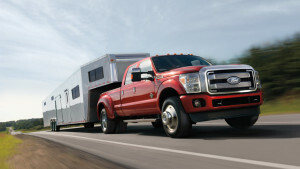 The Super Duty’s Trailer Sway Control will prevent you from losing control of trailers on the highway while you’re driving at breakneck speeds, thus increasing your own safety and that of the drivers around you. With its Post-Crash System, the Super Duty can inform the relevant emergency services providers when you’ve been in an accident without your help. The Belt-Minder reminds you and your passengers to buckle up by providing visual warning on its instrument cluster. Test Drive the 2016 Ford Super Duty Today! Here’s the thing, though: you don’t even have to take our word for it. You can test drive the 2016 Ford Super Duty yourself simply by visiting our Glenwood Springs Ford dealership, located at 55 Storm King Road in Glenwood Springs, or feel free to give us a call at 970-945-2317. On the other hand, you can always contact us via email as well by filling out and sending this online form. Don’t wait: explore the 2016 Ford Super Duty today!